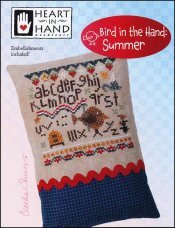 Bird In The Hand: Summer [G1862] - $8.50 : Yarn Tree, Your wholesale source for cross stitch supplies. Cross stitch pattern from Heart In Hand. It's summertime! Bees are buzzing, birds are singing & strawberries are growing! The alphabet is stitched throughout this design. Stitch count 60w x 60h.